SolidProxies offer private HTTP proxies, and you can use their proxies as socks with their software magic proxy as it generates its own binding ips that can be used as socks. I tested their proxies with GSA search engine ranker,You need add it on “use SolidProxies.com API”, It’s great for GSA scraping and posting, the proxies will be auto-replace from SolidProxies’s IP pool when your proxies are banned or gets errors. That’s a little like Backconnect Proxies. The only downside is that the speed of proxies is not as fast as other dedicated proxies. Here is dedicated proxies packages that Solid Proxies service offered. Datacenters in europe and most east and west coast datacenter in the USA. Proxies is requiring IP-authentication in default. And You can authorize up to 2 ips, And each Package is only limited by 1 PC you can use at the same time. BTW, Mac Osx is not Supported for it’s need both .net framework 3.5.1 and .net framework 4.5.x. Also, You can get Semi-Dedicated Proxies that’s share with up to 3 users. It’s a half price on dedicated proxies packages, It’s a cheap solution for GSA ser, and other SEO tools. 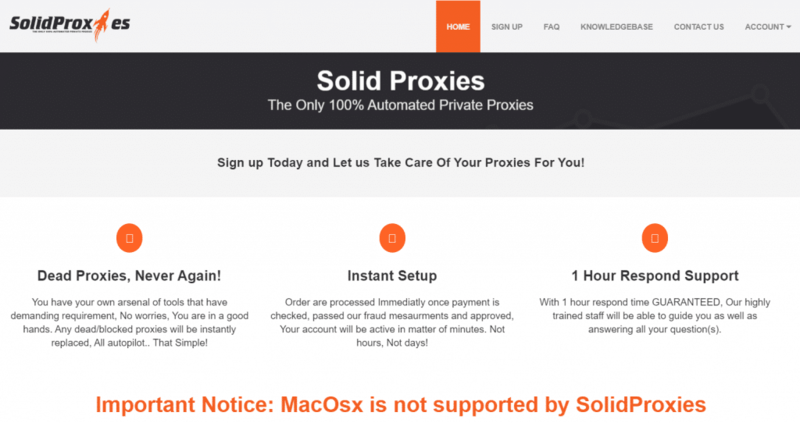 SolidProxies.com is a special proxy service that offers Automated Private Proxies. If you already used their service please share your reviews, Let’s us know more about their service.